New Pictures Of My Grand daughter Amy!!! I have Brand New photos of my darling Grand daughter little Amy!!! YAY!!! get so big!!!! Oh I MISS HER!!!!!!! Amy and Yoda just hangin out!!!! 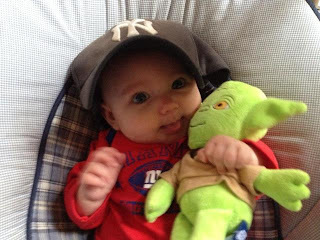 Yoda is also pretty good for sucking on!! Sleep well little Angel....Yoda you keep watch ok? Hope All of you enjoy a wonderful weekend!! !